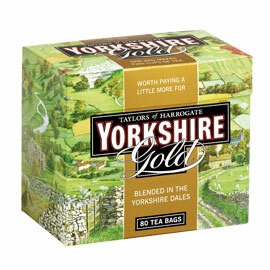 Award winning Yorkshire Gold Tea Bags/Sachets. Teas from twenty tea gardens are blended to give Yorkshire Gold the perfect balance of strength, colour, flavour and character. The golden flecks you will see in our loose tea are the hand-plucked tips of the leaves - a sure sign of extra quality. Serendipity's Best Selling Tea with good reason!